We’re on a mission to improve the accuracy and timeliness of geopolitical forecasts by advancing the science of forecasting. Are you up to the challenge? 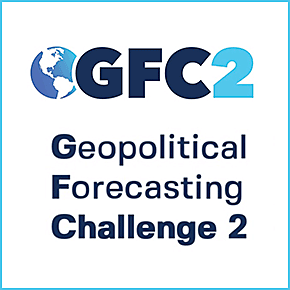 The second Geopolitical Forecasting Challenge (GF Challenge 2) presents Solvers with questions ranging from political elections to disease outbreaks to macro-economic indicators and asks for innovative, programmatic solutions that can include any combination of human forecasts and their own data sources and models into accurate, timely forecasts. This is your chance to test and showcase your forecasting methods and prove yourself against other state-of-the-art methods. GF Challenge 2 offers Solvers the opportunity to advance your research, contribute to global security and humanitarian activities, and enhance the science of forecasting, as part of a collaborative community.